I heavily thought about purchasing a guest book from Etsy or other specialty wedding websites, but I wanted something very personalized and very me. I don't quite remember how I stumbled upon the idea of a Polaroid Guest Book, but it was one of my favorite things I did myself! I found the Scrapbook for $16, the Photo Corners for $3 and the individual pages of White Cardstock Paper for 78 cents a piece at Joann Fabrics, and the Instax 3-Pack Film for $37 from Amazon. I already had my Instax camera and a ton of Sharpies for everyone to sign their names on the picture. I had the pages set up to host three Polaroid photos per page with enough room to write next to, beneath or nearby the photo. The day of the wedding, most of the guests ended up taking a picture, signing the picture and leaving it on the table. In all honesty, this was really awesome because I was able to sort the photos later by family and friends. This was definitely one of my favorite things to look back on from the wedding. The invitations are by far the one thing I am most proud of. I searched so long online for invitations that I loved, but every time I found one it ended up costing SO MUCH. After many months of search and disappointment, I turned to Pinterest. I searched again for diy invitations and found a couple styles that I really like, but none that were perfect for the wedding. It wasn't until I was browsing Etsy for gifts that I found digital watercolor art that I could purchase and use to my liking. I was ecstatic! This was exactly what I had been looking for! My lovely mother-in-law is one of the most paper-crafty people I know, and she offered to help us make our invitations. We took a day to look through different textures and colors of cardstock paper along with comparing them to the watercolor art I was wanting to use. We made a decision, and I got to work on creating the invitation of my dreams! It took me a very long time to get the wording right, but it happened. Because my husband and I were hosting (and paying for) the wedding ourselves, we decided that starting the invitation with 'Together, with their families.' I color matched the text with the colors in the flowers, and mixed the font with something bold and easy to read with the swirly calligraphy to make the invitation seem more elegant. I did the same thing with the RSVP's, but snuck in a couple phrases that really brought out our relationship. For the 'Plus One,' we used the phrase 'It's Dangerous To Go Alone!' from The Legend Of Zelda, along with a secret watercolor Tri-Force in the corner of the RSVP. We also went with the standard shape of a post card for the RSVPS so we could smack a stamp on the backs of them to make it very easy for our guests to send back to us. My mother-in-law received the paper we were going to use and printed out a test invitation to see how they would look. At first, we were so worried because the image came out very pixelated and fuzzy. We wondered if our laser printer would work better. It did! The only catch was that our printer did not like picking up the paper on it's own. We ended up having to hand-feed the paper into our printer to get it to print at all. It took us several hours to get the invitations and the RSVPs printed. Once everything was printed and dried, my MOL came to our apartment to help cut and put together the invitations. We had a silver cardstock as the backing of the invitation to make it pop a little. We also had some cream lace that wrapped around the middle of the invitation, and lastly it was all tied off with teal string and a tag that had our names, and the date of the wedding. The process of putting all of this together took a few hours, but in the end it was SO worth it! 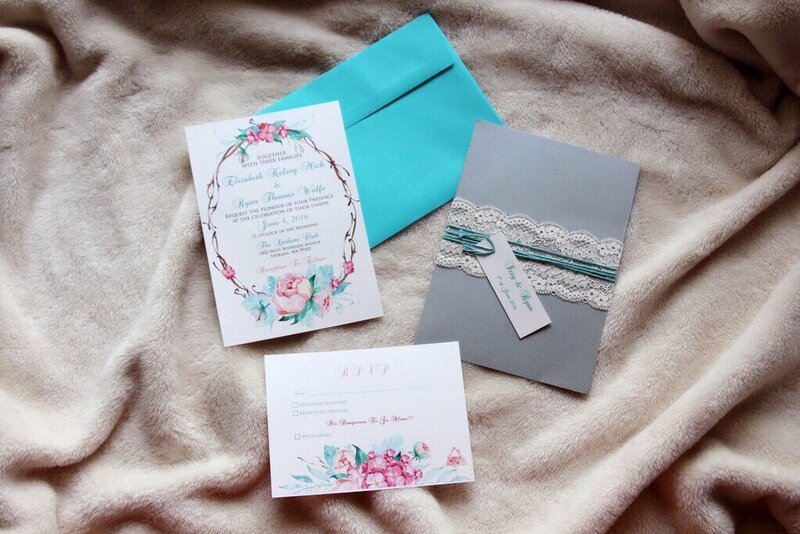 We printed off labels to go on each of the teal envelopes and RSVP's and off they went! I never really totaled up how much we spent, but we saved hundreds of dollars by making them ourselves. Watching the RSVP's show up in my mailbox always made my day! And, we got SO many compliments on the invitations and where we got them. My guests we surprised to hear that we had made them ourselves, and the gratifying feeling of doing it was amazing! I got the water color files from OctopusArtis for a total of $16.09 and that was all I spent with my own money on these invitations! And a HUGE thanks to my Mother-in-Law, Lesa. We could not have made these beautiful wedding invitations without your help and expertise! I hope this encourages some of you brides out there to do more yourself with your wedding. There were quite a few other things I did myself, but none were as gratifying as these two. Let me know what you did yourself for your wedding! I'd love to know! !